Bamako – IOM Mali has temporarily suspended assisted voluntary return and reintegration (AVRR) services for roughly 1,500 migrants to better assess their eligibility after evidence surfaced suggesting that attempts were being made to take advantage of this service. “We are reviewing hundreds of pending AVRR cases at our ad-hoc transit centres in Bamako and will resume our efforts once we are satisfied that the assistance is being provided to the people who are most in need,” Bombassei added. Since its launch in December 2016, the EU-IOM Joint Initiative for Migrant Protection and Reintegration (Joint Initiative) has provided return and reintegration assistance to over 51,000 people stranded along the migratory routes from West and Central Africa to North Africa and Europe. Vulnerable migrants like these can request IOM’s assistance to return home in a voluntary, dignified and humane manner, and once there, access reintegration support. In mid-November 2018, the IOM mission in Mali noticed an unprecedented peak in the number of returnees requesting help that did not match the typical flows of people across the Malian borders with Algeria and Mauritania. In early January the Organization advised migrants sheltered at Bamako transit centres that their applications were being thoroughly reviewed to ensure they meet the Joint Initiative’s eligibility requirements. IOM is working closely with the Malian Government, civil society and representatives from the relevant countries of origin to address the situation and ensure available resources are allocated to protect the most vulnerable. 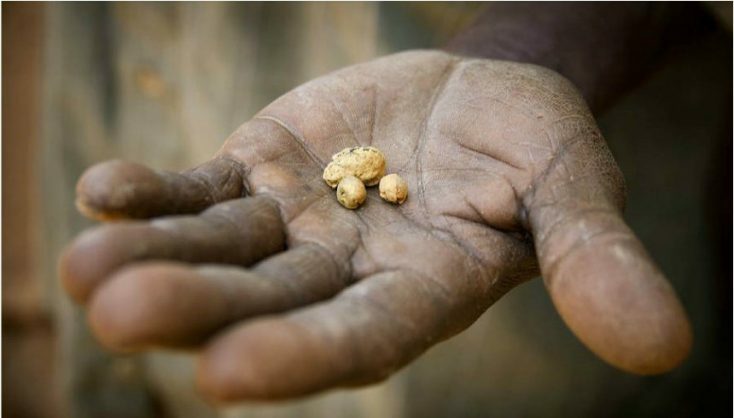 IOM has four decades of experience managing AVRR programmes. 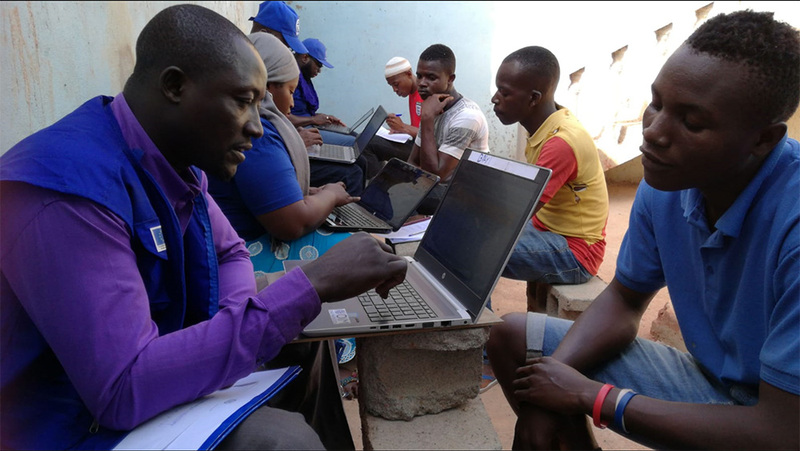 Since the launch of the Joint Initiative in Mali in 2017, IOM has assisted 9,768 West African migrants mainly from Mali, Guinea, Côte d’Ivoire, Senegal, the Gambia, Sierra Leone, and Liberia. Bangkok – Thailand has built its migration management capacity and is well positioned to maximize the benefits of migration if more is done to ensure the welfare and protection of migrants, according to a new report released by the United Nations in Thailand. 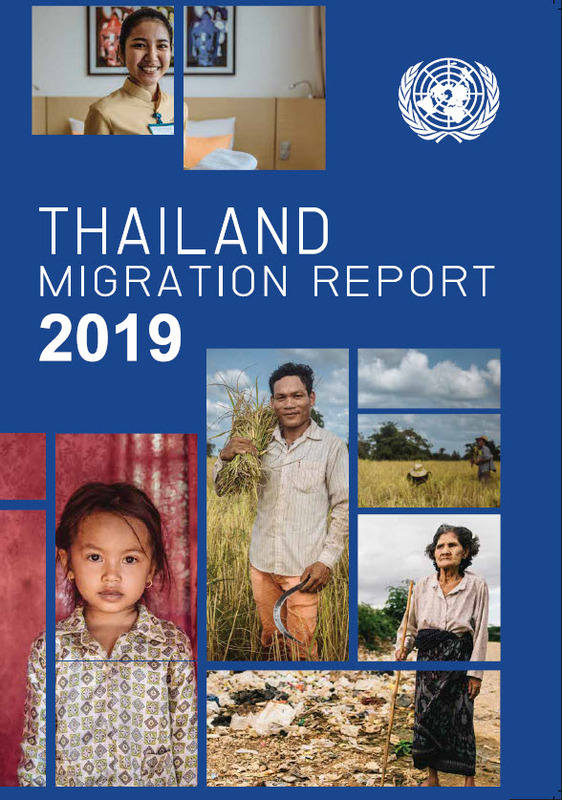 Published on a regular basis since 2005, the Thailand Migration Report 2019 is the latest in a series produced by the UN Thailand Working Group on Migration, which is chaired by IOM and brings together 16 UN agencies. The report comprises 11 chapters that address working conditions, access to services, remittances, human trafficking and exploitation. Chapters are written by contributors from various UN agencies and provide up-to-date information on migration trends and patterns, as well as independent analysis of migration-related issues and policy developments. Most of them come from neighbouring Cambodia, Lao People’s Democratic Republic, Myanmar and Viet Nam, accounting for an estimated 3.9 million documented and undocumented migrant workers. Other major groups include an estimated 480,000 stateless persons, 110,000 skilled professionals and 100,000 refugees and asylum seekers. Thailand benefits significantly from their presence. Migrant workers help fill labour shortages, contribute to economic growth and are becoming ever more important as Thai society ages. Constituting over 10 per cent of the total labour force, their work is thought to contribute between 4.3 to 6.6 per cent of Thailand’s Gross Domestic Product. For migrants and their family members, employment in Thailand supports increased standards of living and poverty reduction in their home countries. Up to USD 2.8 billion in remittances is sent home to families through formal channels to countries in the four main countries of origin every year. The figure rises to as much as USD 10 billion if informal remittance flows are also taken into account. The report notes that important steps have been taken by the Royal Thai Government to combat human trafficking and exploitative working conditions for migrants, including reforms to the laws and regulatory bodies used to manage the fisheries sector, amendment of the Royal Ordinance on the Management of Foreign Workers Employment, establishment of Migrant Worker Assistance Centres, and ratification of the 2014 Protocol to the Forced Labour Convention, 1930 (No. 29). Nevertheless, many migrants continue to face hardship and remain vulnerable to abuse. “While the situation for migrants in Thailand has improved in some ways since the last report in 2014, many challenges remain the same. Policy responses risk leaving migrants vulnerable and unsure of their legal status in Thailand," said report editor Benjamin Harkins. Thailand has enacted progressive policies that guarantee migrants access to many essential services regardless of legal status, including education and health care. But barriers continue to hamper their use of these services in practice. Only 51 per cent of all eligible migrants are currently enrolled in public health insurance schemes, while up to 200,000 migrant children remain out of school, the report notes. Each chapter of the report provides recommendations for policy and programmatic changes to improve migration governance. “In line with many of the objectives in the 2018 Global Compact on Migration, recently adopted and endorsed by the Government of Thailand, the report provides key recommendations for all stakeholders to ensure that migration remains well-managed, safe, orderly and regular,” said IOM Thailand Chief of Mission Dana Graber Ladek. UN Resident Coordinator in Thailand Deirdre Boyd noted the important emphasis on partnerships in the report, with the government, private sector, civil society, trade unions, international organizations and the media all having a part to play. “The United Nations is committed to supporting Thailand in its efforts to establish a long-term, coherent and rights-based governance framework that maximizes the benefits of migration for both migrants and society as a whole,” she stated. The Thailand Migration Report 2019 is a publication jointly produced by members of the UN Thailand Working Group on Migration. These include: FAO, IOM, ILO, OHCHR, UN-ACT, UNAIDS, UNCDF, UNDP, UNESCO, UNFPA, UNHCR, UNICEF, UNODC, UN Women, the treate Bank and WHO. Cox’s Bazar – IOM has begun a distribution of essential household items to 10,000 vulnerable local families in Cox’s Bazar, Bangladesh, where almost a million Rohingya refugees are now living after fleeing violence in Myanmar. Global attention has focused on the plight of the hundreds of thousands of Rohingya Muslims from Myanmar sheltering in Cox’s Bazar. But many local communities in the impoverished and underdeveloped district were also affected by the arrival of over half a million destitute people in August through September 2017, which put massive strain on infrastructure and pushed up prices. The household kits include two blankets, two floor mats, one kitchen set and three bamboo baskets. Their distribution comes as winter weather brings cold nights to the district, which faces the Bay of Bengal in southern Bangladesh. 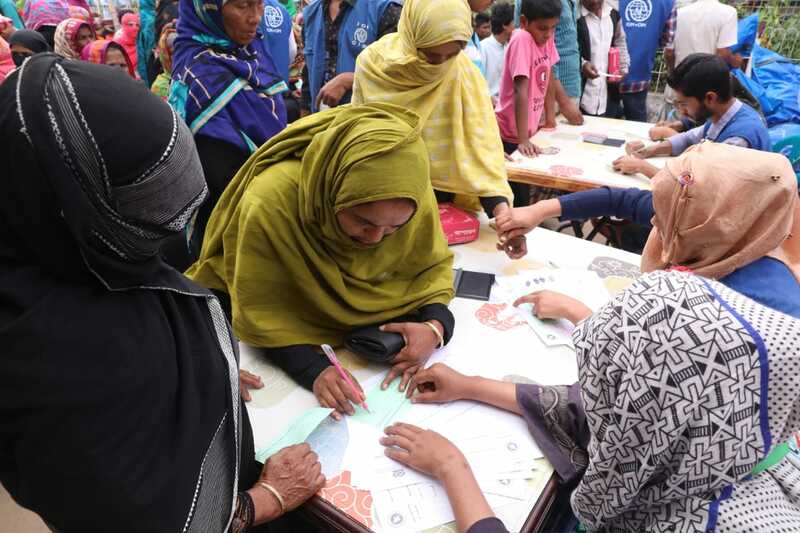 The distribution, which is taking place in close coordination with local government, follows a survey of 48,000 households in the Cox’s Bazar’s Ukhiya sub-district conducted by IOM and local government officials to identify those most in need. Families targeted for assistance include female-headed households and single parent families; families with family members suffering from a disability or serious illness; pregnant or lactating women; child-headed households and those with a separated or unaccompanied child; and families reliant on irregular or casual labour, or whose income fell due to the impact of the refugee crisis. Among the first to receive the kits was 36-year-old Rahima Khatun, who has four children, one of whom has a disability. “With these mats and blankets he will be able to sleep better,” she said. 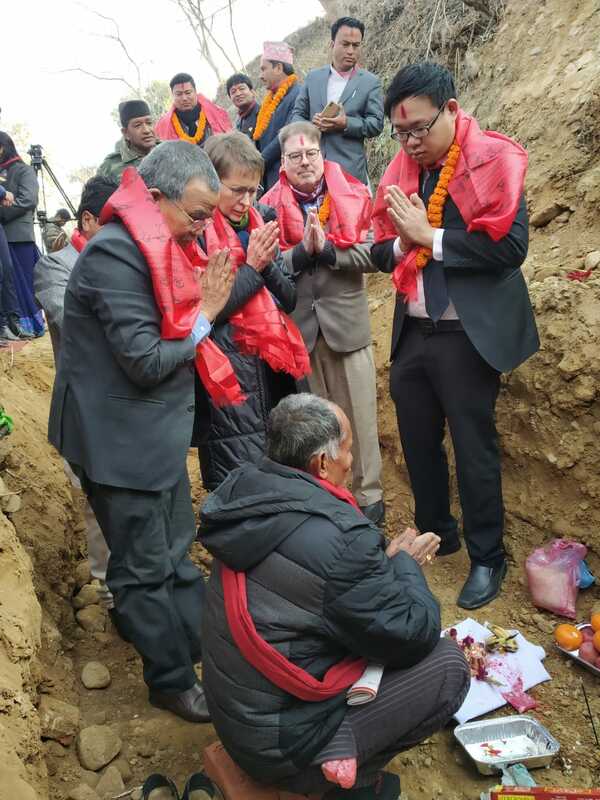 “The local community in Cox’s Bazar has been remarkably generous during the refugee crisis and we know that the need for support extends beyond those in the refugee camps. IOM is committed to extending our support to the host community and these kits will help make life more comfortable for some of Ukhiya’s most vulnerable families,” said Manuel Pereira, IOM’s emergency coordinator in Cox’s Bazar. IOM was already working with local communities and in smaller refugee settlements in Cox’s Bazar, supporting the government of Bangladesh with medical and other services, when the Rohingya refugee crisis erupted in 2017. Since then IOM and its partners have expanded health services for all in the area and launched several projects specifically targeting local communities with services including: disaster risk reduction; improvements to infrastructure and water supplies; support for reforestation and local farmers; and programmes aimed at developing community cohesion. Brussels – The International Organization for Migration (IOM) presented today (22/01) four recommendations on migration to the Romanian government, which took the helm of Presidency of the Council of the European Union (EU) on 1 January 2019 for a six-month tenure. The recommendations focus on the migration dimension of EU’s next long-term budget, the Multiannual Financial Framework (MFF). 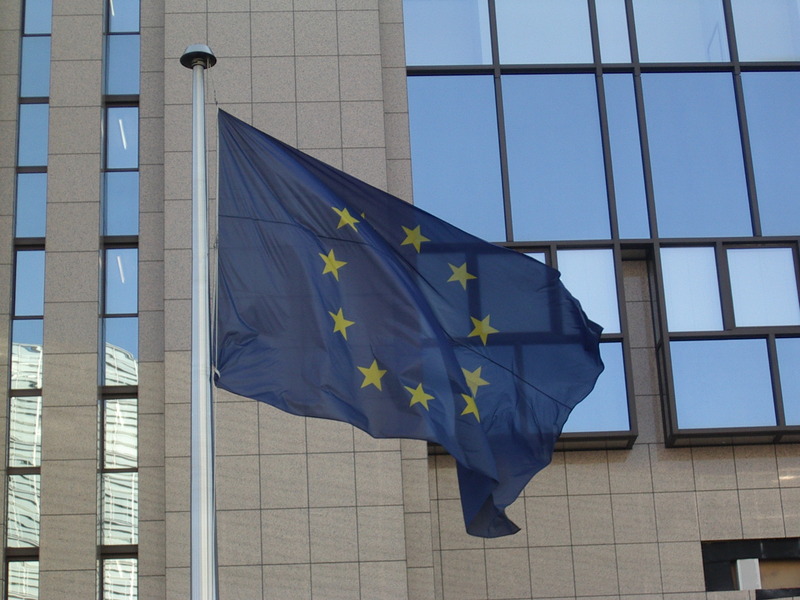 “Romania will be leading the rotating EU Presidency through a critical period of substantial institutional changes for the European Union, and so ensuring the adoption of the EU’s next long-term budget will be a key priority,” said Ola Henrikson, IOM Regional Director for the European Union, Norway and Switzerland. “Our recommendations are grounded in IOM’s view that the MFF should respond to the needs and commitments of the EU and its partners to ensure better migration governance in all of its dimensions,” he continued. The Organization’s recommendations paper aims to promote EU migration funding that is more simplified, coherent and holistic, people-centred and rights-based, and increasingly directed towards legal migration and integration. Given that migration is not a new or short-term phenomenon, IOM also recommends that policy and action on migration needs be implemented in a coherent and holistic way and should follow a long-term, strategic vision. Doing so would help to maximize the added value of EU financing, particularly considering the growing level of international engagement in this area. EU migration funds are particularly instrumental in promoting the well-being of migrants and local communities in countries of origin, transit and destination. IOM believes EU funding should therefore be guided by international and European human rights law; ensure that EU actions are also gender-responsive and child-sensitive; and focus on integrating tailored responses, including for vulnerable migrants. Legal migration and integration are closely interlinked priorities which should be considered on equal footing as policy objectives for EU funding. Considering the EU’s commitments made at the Valletta Summit on Migration and within the Partnership Frameworks, together with forecasted labour shortages in the EU at all skill levels, IOM recommends that more EU funds should be directed towards legal migration and integration. Finally, funding rules and processes must become genuinely simpler for implementers of EU funds to facilitate increased access and partnerships. IOM's twice-yearly recommendations to the rotating EU Presidencies are guided by its Migration Governance Framework (MiGOF) which is the first, and so far, only detailed articulation of planned and well-managed migration policies. 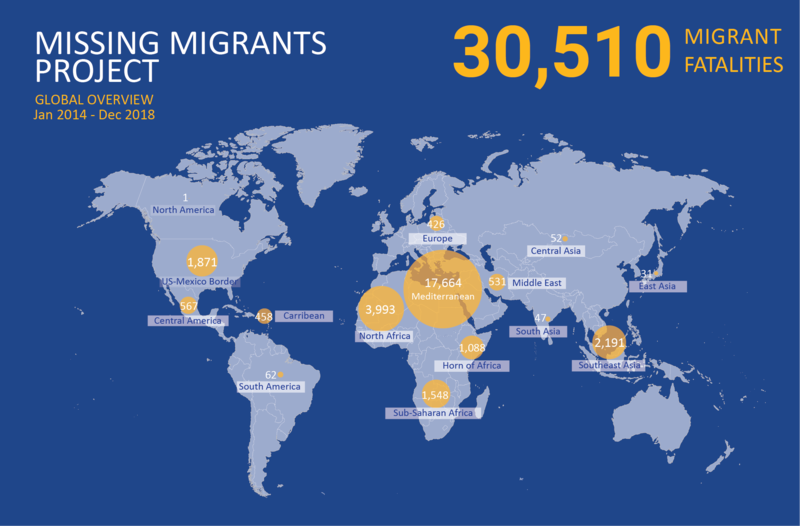 IOM continues to encourage the EU and its Member States to promote a comprehensive approach to migration that puts the rights, needs, capacities and contributions of migrants at its core, with a view to ensuring their safety, dignity and human rights. Geneva – IOM, the UN Migration Agency, reports that 4,883 migrants and refugees have entered Europe by sea through the first 20 days of 2019, a slight increase over the 4,466 arriving during the same period last year. Deaths on the three main Mediterranean Sea routes through almost three weeks of the new year are at 203 individuals, compared with 201 deaths during the same period in 2018. At this point in 2017 a total of 3,156 irregular migrants or refugees had landed in either Greece, Spain or Italy after crossing the Mediterranean, and IOM had recorded a total of 228 deaths. 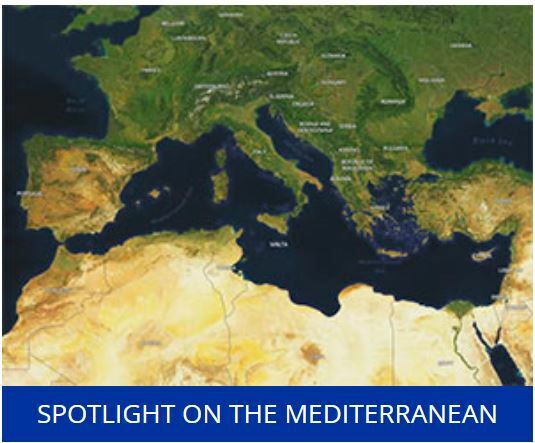 Nonetheless, IOM’s Missing Migrants Project (MMP) reports that January 2019 marks the fourth straight year in which January has seen at least 200 irregular migrants and refugees drowning trying to reach Europe via one of three Mediterranean Sea routes. The worst was in 2016, when 370 people died in January crossings. Those fatality numbers had been dropping – to 254 and 243, respectively, in 2017 and 2018 – and could drop again this month depending on what occurs over the next 10 days. 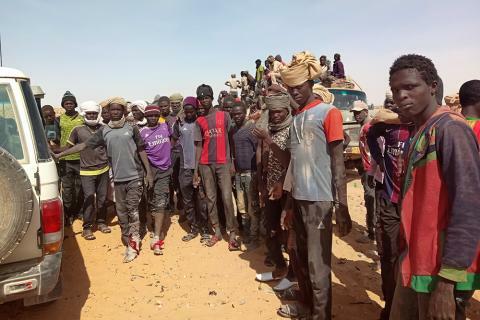 IOM noted late Monday that the commercial cargo vessel Lady Sham had returned 144 rescued migrants to Libya, while it remains unclear from where these individuals departed from, and when. IOM staff counted among the rescued 26 women—some of whom are pregnant—and four children. IOM understands most of these individuals have been taken into custody, but it cannot confirm that all have been. IOM staff today will continue to monitor their condition. “We identified that there was the potential for our humanitarian efforts to be exploited by people who were not entitled to assistance which undermines IOM’s ability to help truly vulnerable migrants who meet eligibility criteria,” said Michele Bombassei, IOM’s migrant protection and assistance specialist for West and Central Africa. For more information, please contact Florence KIM at IOM Regional office for West and Central Africa: email: fkim@iom.int; Tel. +221786206213. 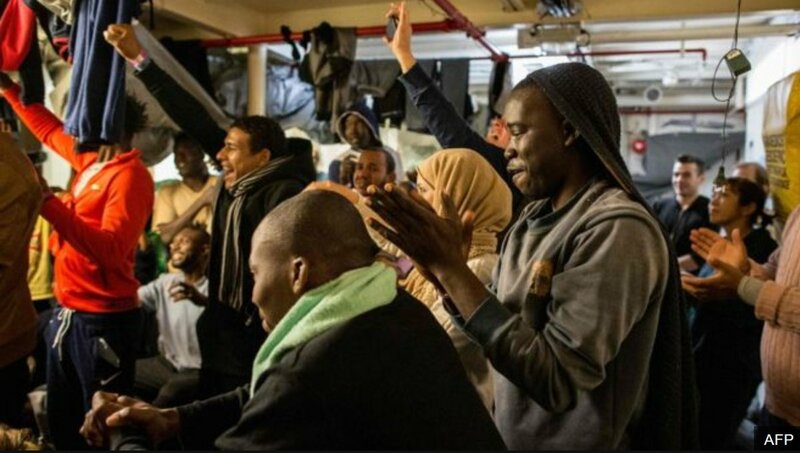 Geneva – IOM, the UN Migration Agency, reports that 4,216 migrants and refugees have entered Europe by sea through the first 16 days of 2019, an increase that nearly doubles the total (2,365) arriving during the same period last year. Over the past three days (13-16 January) IOM reports arrivals to Spain more than doubled from 1,609 to 3,367 individuals. Through mid-month, irregular migrant arrivals by sea to Spain are nearly 80% of all Mediterranean arrivals of this type; moreover that total nearly matches all arrivals of this type to Spain through the first three months of 2018, a period during which IOM reported 3,369 irregular migrant arrivals to Spain by sea. Deaths on the three main Mediterranean Sea routes through these first 16 days of January are at 83 individuals, compared with 199 deaths during the same period in 2018. Geneva – The International Organization for Migration’s (IOM) Director General António Vitorino welcomed the contribution made this week by the State of Kuwait during a meeting with Ambassador Jamal Al-Ghunaim, Permanent Representative of the State of Kuwait, at the Organization's headquarters in Geneva. The Government of Kuwait contributed USD three million to fund IOM’s ongoing humanitarian response to the emergency in Syria in 2019. This marks the sixteenth straight year of donations to IOM from Kuwait, exemplifying the country’s continued commitment to IOM's global humanitarian interventions. "This contribution reflects Kuwait’s leading humanitarian and policy role in the Middle East and North Africa region, and in the Gulf Cooperation Council. Kuwait has become one of IOM’s biggest partners, contributing significantly to advancing migration governance,” said DG Vitorino. The funds will help save lives and improve the conditions of conflict-affected populations, including internally displaced persons (IDPs), refugees and returnees. Domestically, the Government of Kuwait has increased efforts in combating human trafficking, and in managing labour mobility. IOM continues to expand its technical support to the Government on programmatic areas, such as community cohesion and victim protection, through capacity building programmes. Abuja - The International Organization for Migration is appalled by Monday’s attack in Rann town, Borno State, in northeast Nigeria, that claimed the lives of four internally displaced persons (IDPs) and badly damaged an IOM Humanitarian Hub. All IOM staff have been reported safe however the attackers overran and severely damaged the Organization’s Humanitarian Hub, which was under construction. Hubs are instrumental in enabling the delivery of lifesaving humanitarian assistance to IDPs in the northeast of the country. Imagine too that one way of improving those prospects involved leaving your country and traveling hundreds of miles to work the streets of a teeming African city. Now imagine you’re 11 years old. Except that there is no need to imagine any of this. These are the realities of the 1,137 children the International Organization for Migration helped survey to complete a study on street children in Djibouti. The purpose of the study was to provide a diagnosis of the living conditions of these children in Djibouti city, the capital, and to provide recommendations. The study, Report On Street Children Living in Djibouti—”Etude Sur les Enfants en Situation de La Rue dans la Ville de Djibouti”-contributes to recent reporting by IOM concerning the robust movement of irregular migrants through the Red Sea region bound for Persian Gulf states including the Kingdom of Saudi Arabia and other Gulf Cooperation Council (GCC) countries. Last month IOM reported seaborne irregular migration to Yemen in 2018 would surpass the volume of similar migration to Europe via the Mediterranean Sea. Those findings were featured in the report Mixed Migration in the Horn of Africa and the Arab Peninsula. In 2018, IOM recorded 150,000 migrant arrivals into Yemen, twenty per cent were minors. The long journey is often made by foot and exposes people on the move to dehydration, illness and human rights abuses, including trafficking. 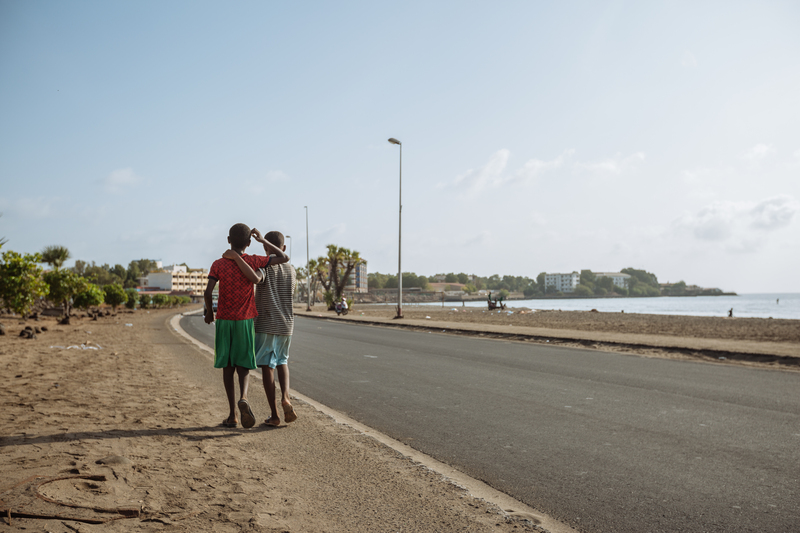 Djibouti might appear to be an unlikely place to sustain a population of foreign street children. But not when you consider that it is a major transit location for migrants, especially from Ethiopia, who seek to cross over to Yemen, and ultimately to the Arab Peninsula. The journey through Djibouti is grueling. Those with some money hitchhike. The rest might simply find themselves trapped, unable to get to the coast – for the cross-over into Yemen – through one of the driest and hottest places on earth. IOM’s Displacement Tracking Matrix recent report documents trends on this mixed migration route from the first half of last year. The population covered by the study was children aged 0 to 17 identified as living on the street. A total of 1,137 children were surveyed, including 633 children aged 0 to 9, including 195 girls (30.8%) and 504 children aged 10 to 17, of whom 64 (12.7%) were girls. One respondent reported working long hours in a restaurant—earning about USD 56 per month in the local currency—money he was able to remit back to family members in Ethiopia. The survey was conducted by the Ministry of Women and Family Affairs and the Directorate of Statistics and Demographic Studies (DISED), with assistance from IOM, the International Organization for Migration. A national consultant, Amina Saïd Chiré provided the literature review and the qualitative analysis, while DISED took charge of the quantitative survey and analysis. Providing technical support was an international consultant, Michel Poulain. The purpose of the quantitative survey was to enumerate the street children, to understand how and why they end up on the streets and to identify their priority problems. It was conducted in the urban agglomeration of Djibouti which has the majority of street children in the country. During the opening ceremony of the study’s validation workshop recently, the Minister of the Interior, Hassan Omar Mohamed Bourhan, thanked the European Union for supporting the study, and insisted on the need to identify all street children in Djibouti to better protect them. Minister of Women and Family Affairs, Moumina Houmed Hassan, reaffirmed the Government’s commitment to tackling the issue head on through the implementation of five measures, namely: the creation a coordination platform; the reinforcement and development of reception facilities; the establishment of an identification system; the definition of basic minimum service; and the development of a national protection strategy. Head of Delegation of the European Union in Djibouti Ambassador Adam Kulach said the situation of street children was a tragedy that affected everyone. He said the problem would be the focus of the EU’s attention through the implementation of a EUR 2 million project for children in street situations in Djibouti. Geneva – IOM, the UN Migration Agency, reports that 2,200 migrants and refugees have entered Europe by sea through the first 13 days of 2019, a slight increase over the 1,915 arriving during the same period last year. Deaths on the three main Mediterranean Sea routes through almost two weeks of the new year are at 16 individuals, compared with 194 deaths during the same period in 2018. At this point in 2017 a total of 1,159 irregular migrants or refugees had landed in either Greece, Spain or Italy after crossing the Mediterranean, and IOM had recorded a total of 12 deaths. The sharp spike in deaths at this time last year was due to a spate of shipwrecks off Libya. A year ago, IOM reported that Libyan Navy sources on 9 January confirmed at least 100 migrants remained missing in the third deadly shipwreck on the Mediterranean Sea since 6 January. IOM had already reported that day a total of 81 Mediterranean Sea deaths of migrants or refugees were recorded in the first eight days of the year. Five of those deaths were in Western Mediterranean waters off Spain and Morocco. The rest – 76 with a possibility of many more – were recorded in the waters between Italy and Libya. In that last incident on the Central Mediterranean route, three rubber boats with 279 migrants (19 women, 243 men, 13 boys and four girls) were rescued by the Libyan Coast Guard, whose rescue operation lasted at least 12 hours. 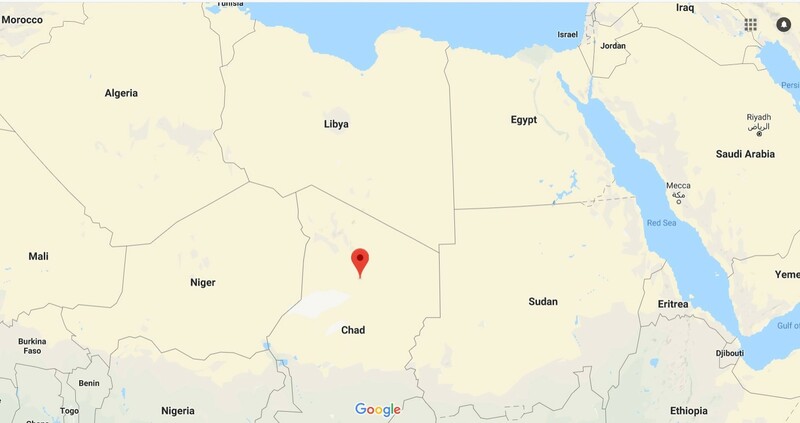 Most recently, the remains of five people were recovered by the Libyan Red Crescent on the shores of Sirte, Libya on 13 January 2019. IOM’s Missing Migrants Project (MMP) team is verifying additional reports of bodies washing up on Libyan shores since 2 January. On the Western Mediterranean route, the remains of a man thought to be a migrant were discovered near Cabo de Sabinar, in Spain’s southern province of Almería, on 5 January. This is the third body recovered on Spanish shores this year which is not connected to any known shipwreck. In Nador, Morocco, the remains of a woman were recovered from waters near Beni Ensar on 11 January, along with six survivors suffering from severe fuel burns. 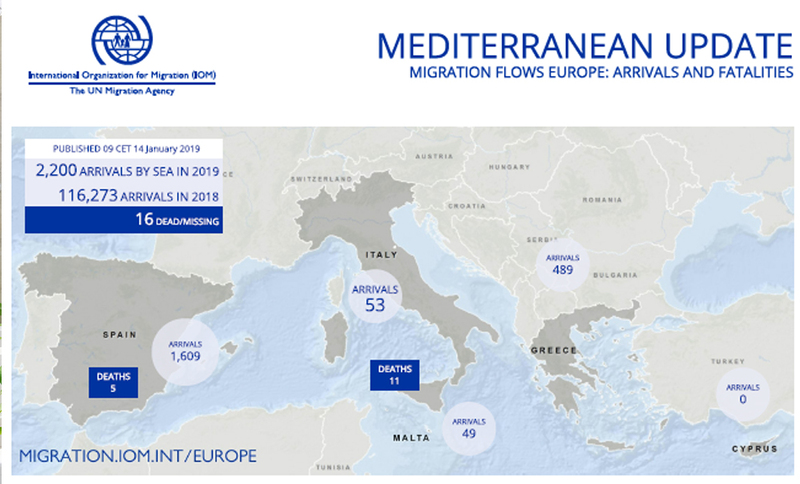 IOM Rome’s Flavio Di Giacomo on Monday noted that according to official Ministry of Interior figures, 53 migrants have arrived by sea to Italy as irregular arrivals through the first 13 days of 2019. That’s a decrease of 93.7% over the same period last year (see chart 1). 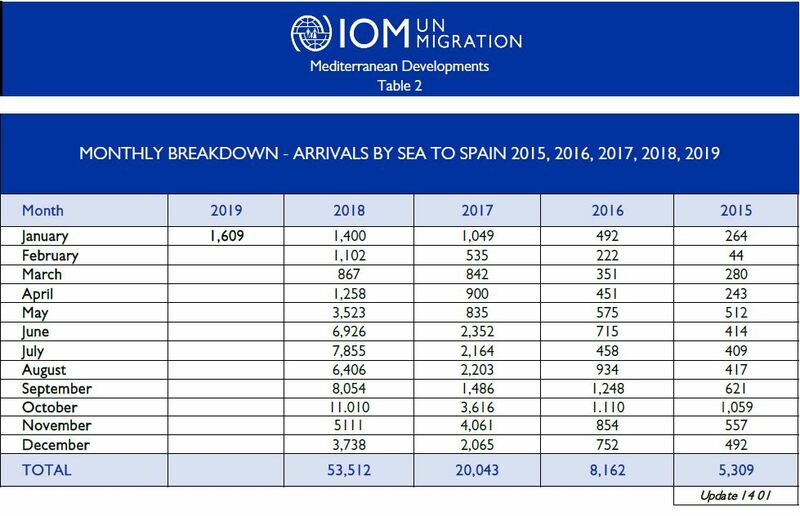 IOM Spain’s Ana Dodevska reported that through Sunday (13 January) 1,609 men, women and children have arrived as irregular migrants this month, or more than the 1,400 arriving through all of January last year (see chart 2). IOM Greece’s Christine Nikolaidou reported on Monday that since 11 January the Hellenic Coast Guard (HCG) disclosed one incident requiring search and rescue operations off the island of Kos. The HCG rescued a total of 13 migrants and transferred them to that island. Those 13 arrivals were among 139 IOM recorded in the four days between 10 and 13 January and bring to 489 the total number of sea arrivals to Greece this year (see chart 8.b). 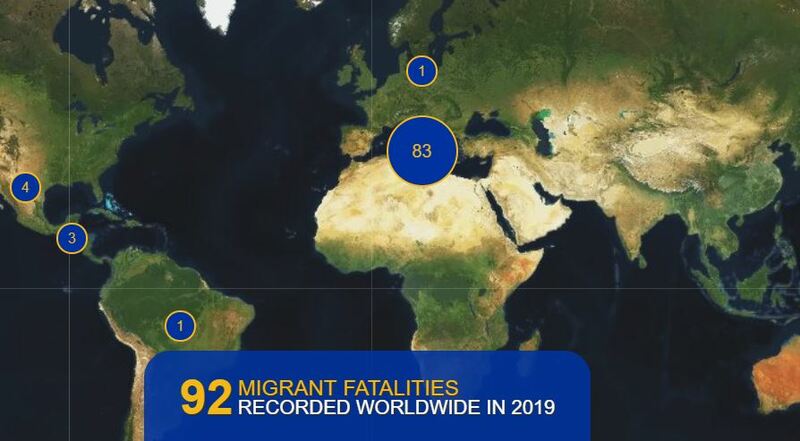 2019 is the fifth year of IOM’s efforts to systematically record deaths on migration routes worldwide through its Missing Migrants Project. Since the beginning of 2014, the Project has recorded the deaths of 30,602 people, and yet due to the challenges of collecting information about these people and what happened to them, the true number of deaths during migration is likely much higher. So far in 2019, Missing Migrants Project has recorded the deaths of 21 people (see chart below). In addition to the deaths recorded on the Mediterranean, on 11 January a 26-year-old man of unidentified nationality was hit by a car when he was walking on the side of the 515 Highway connecting Caen and Ouistreham, France. Ouistreham is a port city in France’s province of Normandie with a cross-Channel ferry service to Portsmouth, UK. In 2018 IOM’s Missing Migrants Project reported there were 43 migrant deaths caused by vehicular accidents on Europe’s highways, and 12 more at various railway points. In Mexico, Missing Migrants Project recorded the deaths of two individuals. In Mexico’s southern province of Veracruz, a 33-year-old man from El Salvador lost his life in a vehicle accident on 12 January. A day later (13 January), the Honduran Government reported the death of a 23-year-old Honduran national in a hospital in Saltillo, Coahuila. He was critically injured after being hit by a freight train several weeks before, on his journey north to the United States. There were 39 train-related deaths of migrants in Mexico last year. 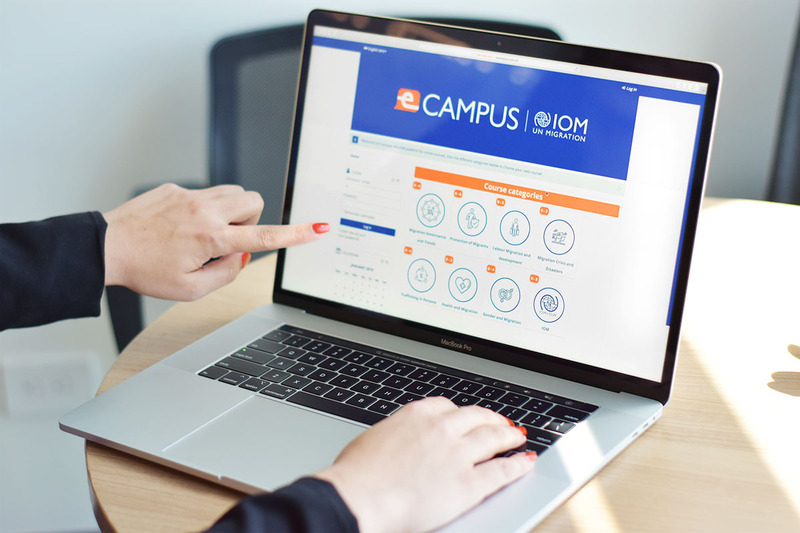 San José – The International Organization for Migration (IOM) has begun 2019 with the launch of E-Campus, a free online learning platform on migration. E-campus provides an opportunity for government officials, civil society, students, academics and anyone interested in updating their knowledge in human mobility. “The world is changing, and solutions must adapt. E-Campus is an excellent migration learning tool which is easy to access and is laden with high-level content. Also, it is an opportunity for other organizations to conduct courses on common issues, in coordination with IOM,” said Marcelo Pisani, IOM Regional Director for Central America, North America, and the Caribbean. 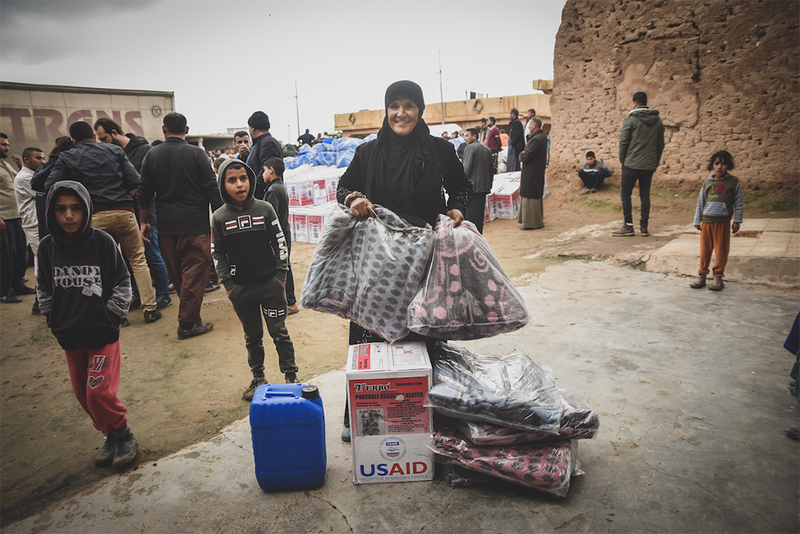 “This assistance has allowed us to recover some household items and to reinforce our shelter which has improved our living conditions,” explained Halimoa, a mother of three. An estimated 252,000 families are living in 371 camps for internally displaced persons (IDPs) across Baidao, 250km northwest of the capital Mogadishu. Many have been displaced for years due to drought and conflict in the region. IOM utilizes a network of community outreach teams to evaluate and communicate the urgent needs of camp residents. In late December 2018, the UN General Assembly took a major step forward, voting to endorse the Global Compact for Safe, Orderly and Regular Migration. This vital agreement sets up nearly two dozen objectives and is aimed at reducing human suffering and boosting cooperation among nations on how to manage legal migration. "Because migration is such a complex issue, you can't just regulate it with one set of rules at an international level," Kristina Touzenis, head of the International Migration Law Unit at IOM tells us. "There are different types of migrants." The debate over rights for migrants is part of a much broader conversation about the strength of democracy. "Most people don't realize how dangerous it is to allow a certain section of the population to be denied their rights, because with this, sooner or later, it will be legitimate to deny all our rights," she says. 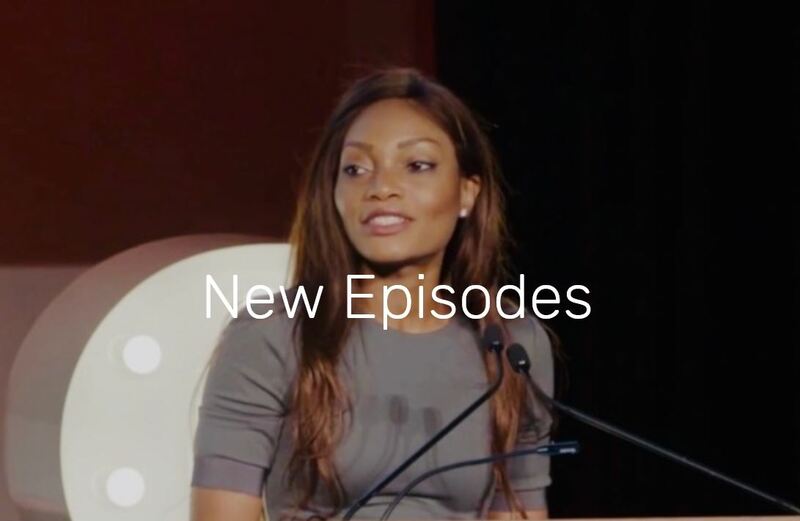 In this episode, our podcast host Tolu Olubunmi shares some of her personal story as a Dreamer and a migrant. Born in Nigeria, Tolu came to the United States when she was a teenager. "Along the way I had lost my immigration status and had become undocumented: shrouded in fear and hidden in the shadows." We hear Tolu's brave story of how she came out of the shadows to advocate for the rights of migrants.